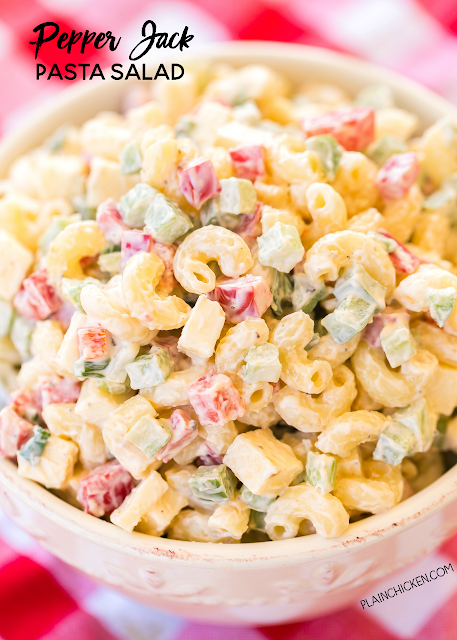 Pepper Jack Pasta Salad - seriously DELICIOUS! So simple, yet so amazing! Macaroni, pepper jack cheese, red bell pepper, green bell pepper, celery, green onions, mayonnaise, salt and pepper. Can make ahead and refrigerate until ready to eat. Perfect for summer potluck! Such an easy side dish recipe! 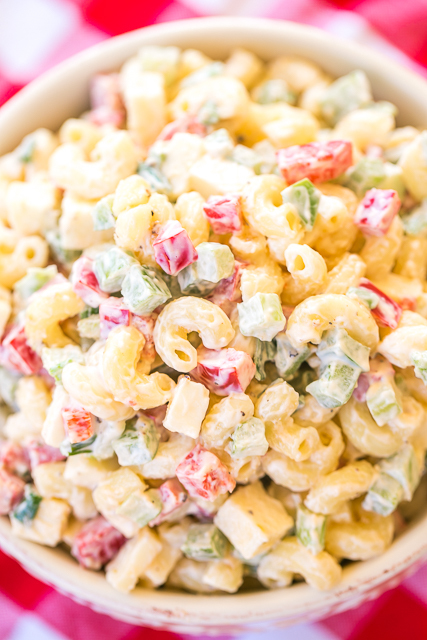 This Pepper Jack Pasta Salad is really simple, but it tastes amazing. Chicken Legs took one bite and couldn't stop raving about it. I shared some with a friend, and the first thing she said to me the next time she saw me was "That pasta salad was delicious!". SO I think that says it all. You need to make this ASAP! Like I said, this recipe is really simple. You can make it ahead of time and refrigerate it before serving. It will last several days in the fridge. This is a great side dish for your upcoming Memorial Day cookout!!! It makes a lot, so it is perfect for a crowd! My favorite thing about this Pepper Jack Pasta Salad wast he little chunks of cheese through out the pasta. I cut up my block of pepper jack cheese into small chunks and tossed it into the salad. YUM! If you don't want the yummy chunks of cheese, you can grate the cheese. If you don't like pepper jack cheese, you can swap it for your favorite cheese. I've only made this with pepper jack cheese, so I can't attest to how it tastes with other cheeses. I'm sure it will be super delicious with any cheese. This pasta salad is simple and delicious! I love the flavors, and how easy it is to add in or take away whatever you want. Very adaptable recipe. I used chopped red onion in place of the green onions and it was wonderful! Definitely a keeper for your summer gatherings! Excellent served along side delicious burgers like your Grilled Meatloaf Burger! I love this! I used a little white onion instead of green, and I add an american blend lettuce to each bowl with s+p. (This Americsn blend has iceberg, shredded carrots, and shredded cabbage.) SOOO good!! :) tastes good with tomato, too! !